FILE - Nigerian President Muhammadu Buhari walks form the stage after speaking at the U.S.-Africa Business Forum in New York, Sept. 21, 2016. The U.S. may be a global superpower, but when it comes to trade and investment in Africa, it lags far behind. China, with $200 billion in trade with the continent, more than doubles that of the U.S.
That means that while Africans paid attention to the U.S. presidential election, they were much more concerned by a slowdown in China's economy. "U.S. dynamics are far less important to us than what's happening in China," said Francois Conradie, head of research at NKC African Economics, a South African subsidiary of Oxford Economics based in Cape Town. "The biggest risk for us is Chinese demand slowing down sharply." FILE - U.S. President Barack Obama addresses the U.S.-Africa Business Forum in Washington, Aug. 5, 2014. During his presidency, Barack Obama made it a priority to try and narrow the trade gap between the U.S. and China. In 2012, he launched the Doing Business in Africa Campaign to help make the U.S. Government's trade resources more easily available to the U.S. private sector, and African public and private partners. In September 2016, he hosted the U.S. Africa Business Forum in New York where he announced $9 billion in private trade and investment with Africa. 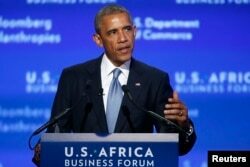 He said U.S. foreign direct investment in African countries rose by 70 percent during his time in office. "I think the key to his legacy is that he has brought trade and investment to the forefront of the U.S.-Africa policy agenda," said Witney Schneidman, senior international adviser for Africa at Covington & Burling LLP and non-resident fellow at the Brookings Institution. "When you look at the totality of this, not only does it say that the U.S. has interests in Africa with investing in the success,” he said, “but that the U.S. wants to be part of the emerging dynamic on the continent that is looking to business to create jobs, to generate opportunities, to generate growth, to generate skills and this is a really important dynamic." A number of U.S. companies are now developing long-term investment strategies on the continent, including the private equity firm Blackstone, General Electric and Johnson & Johnson. The change is apparent, although the American businesses are still considered the new kids on the block. "U.S. corporations are testing the waters, assessing whether investing in Africa is profitable and looking at opportunities," said Alex Vines, head of the Africa Program at U.K.-based Chatham House. "And that's a good thing because the U.S. has been particularly weak corporately in Africa compared to other parts of the world. Very prominent in terms of humanitarianism, very prominent, the world leader, in terms of philanthropic giving, very much less so on the corporate side of things." FILE - Kenyan workers prepare clothes for export at a factory in Athi River, near the Kenyan capital, Nairobi, July 31, 2009. Another milestone during the Obama term was the ten-year extension of the African Growth and Opportunity Act (AGOA), which opened the U.S. market to African businesses by eliminating import levies on 7,000 products ranging from textiles to cut flowers. 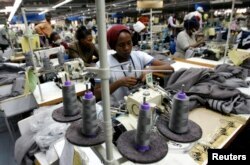 "I think one of the great successes of the African Growth and Opportunity Act has been the expansion of textile manufacturing, particularly in Kenya and Ethiopia where, increasingly, multinational firms have shifted operations from South Asia to East Africa and to the Horn," said Brett Carter, an assistant professor at the school of International Relations at the University of Southern California. "That's, I think, really has been a triumph of the AGOA legislation. It wouldn't surprise me that a Trump presidency would continue that." Looking toward the incoming administration, Schneidman sees AGOA as an opportunity for President-elect Donald Trump to negotiate a better deal. In the 16 years since it was first signed, Schneidman said, much has changed. The continent is much more developed, and the European Union and China have since signed trade deals with African countries that are more mutually beneficial and put U.S. companies and products at a disadvantage. "I think Trump could take a look at this and say, ‘You know, we need to do something different, and maybe we need to make AGOA a little tougher as it concerns the access of U.S. companies to the continent,'" Schneidman said. FILE - Workers of Ivory Coast Kuyo pipeline company assemble pipelines in Tiebissou, near Abidjan, the economical capital of Ivory Coast. But Carter believes Trump's main emphasis in economic partnerships with Africa will relate to oil and gas extraction. He pointed to the fact that Trump's nominee for Secretary of State, Rex Tillerson, the former head of ExxonMobil, has prior relationships with the leaders of the Republic of Congo, Equatorial Guinea and Angola. "I would, I think, expect more of a focus on extractive industries than I would on supporting nascent manufacturing sectors, frankly," Carter said. "I should say that those manufacturing sectors would be far more potentially lucrative for the continent's economic growth." Carter also worried that the U.S. could lose its focus on good governance and democracy in a chase for lucrative deals. 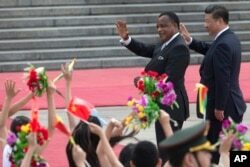 FILE - Chinese President Xi Jinping, right and Republic of Congo President Denis Sassou Nguesso wave as they walk past Chinese children waving flags and flowers to welcome them at a welcome ceremony held outside the Great Hall of the People in Beijing, China, July 5, 2016. He pointed to media reports that Trump planned to grant his first meeting after the election with an African head of state to Denis Sassou-Nguesso, the president of oil-rich Republic of Congo. Sassou-Nguesso has ruled the country for all but five years since 1979, and recently pushed for the constitution to be amended so he could have a third consecutive term in office. "Many citizens from various parts of the continent want the United States to be less willing to sacrifice its humanitarian ideals for economic gain," Carter said. "And I think that it's quite clear that the Trump administration will privilege economic gain, the United States economic interests, over, frankly, the concerns for most African citizens."